Rich Coyle, Coyle Trucking, Inc.
"Banking with someone who understands our business needs makes the lending process quicker and easier." — Rich Coyle, Co-founder, Coyle Trucking, Inc.
Driving toward your long-term goal is easier when you've worked with the same lender year after year. 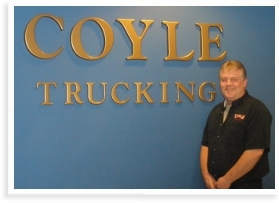 Coyle Trucking, Inc. financed a truck with Washington Financial more than 10 years ago. Now, they stand with over 60 units and are soon to complete a 6,000 square foot expansion to their Pennsylvania headquarters. As their business grows, the company's founders, Harry and Rich Coyle, credit Washington Financial's knowledgeable and prompt service. 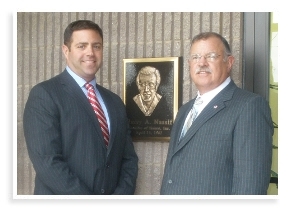 Vice President Rich Coyle attributes the company's banking relationship primarily to their Relationship Manager, Lonnie Nicholls. "Every year, we review our financials, so Lonnie knows where we stand and what we are capable of doing," said Rich Coyle. "Banking with someone who understands our business needs makes the lending process quicker and easier. Together, we make a good team." Coyle Trucking, Inc. provides safe, dependable truck transportation for their shippers. Their trucks have no limitations or restrictions for pick-up and delivery, and they provide quality equipment with the best-trained drivers. At Coyle Trucking, they pride themselves on their exceptional customer service and ability to customize pricing and services. "It was a natural decision to bank with Washington Financial." Both companies opened for business in the late 1800s. Both believe in providing customers with personalized attention. Both offer customers traditional dependability coupled with today's advanced technologies. Medart, a manufacturer of metal bar processing equipment since 1874, designs and builds every piece of machinery to fit each customer's unique situation. An indirect supplier to the aerospace industry, Medart's business was slow immediately following September 11, 2001. During this time, Medart lost the support of its large and impersonal bank. Medart needed financing for its expansion as the aerospace industry slowly rebounded and picked up momentum. Washington Financial Bank stepped in and financed the company's capital improvements and growing working capital. According to Jim Pierce, Executive Vice President and co-owner of Medart, their philosophy of designing and building every piece of machinery to fit each customer's unique situation is definitely in line with the Bank's personalized approach to helping its customers meet their financial needs. "Washington Financial is a great partner," says Jim. "They understand our business needs and work with us to meet them." Jim Nassif, Sr., Hanco, Inc.
"They have always been quick and responsive to our needs." — Jim Nassif, President, Hanco, Inc. Businesses with a meticulous attention to detail run like a fine-tuned machine. With three generations of experience, Hanco, Inc. understands the importance of customer service and attention to detail. Their commitment to providing the highest levels of customer service and meticulous attention to detail made it only natural for them to choose a bank that shares their values. The Nassif father and son team agree that Washington Financial helps them spend less time on banking and more time on business. "We appreciate that most of our business can be handled in as little time as a phone call," said Jim Nassif, Sr. "They have always been quick and responsive to our needs." 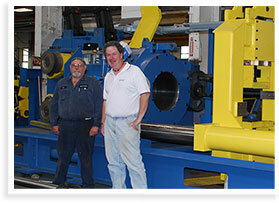 Hanco, Inc. was born out of the pride and work ethic of the steel industry. They continue to grow using the foundation of industrial expertise and innovation. Hanco, Inc. provides Mechanical Repair Services and Preventive and Predictive Maintenance services. Hanco, Inc. also has a division in the company dedicated to supplying and servicing Medical Gas Equipment. "We know we can count on Washington Financial to not only understand our business needs but to offer the best solutions to help meet them." In today's environment, every successful family run business knows that in essence, relationships are the basis of its existence and potential to prosper. Alex E. Paris Contracting Co., Inc. (AEP) was founded in 1928, originally working on Western Pennsylvania area projects, primarily building roads. AEP is now a full-service, heavy civil construction firm with an emphasis on underground utility work. The company operates an equipment division and an industrial service division. When the Paris family decided to branch out into other ventures, such as an equipment rental company and land development, they turned to Washington Financial for funding. Washington Financial has been a strategic partner with the Alex Paris group for years. Because Washington Financial took the time to develop a relationship with AEP it was able to understand and finance these projects. Today, that relationship continues to grow stronger and stronger. "We know we can count on Washington Financial not only to understand our business needs, but to offer the best solutions to meet them", said Alex Paris, the founder's Grandson and current owner. "We know that Washington Financial always has our company's best interest in mind. The team from Washington Financial takes time to listen to our questions, thoughts, and more importantly, provides input based on their insights. We have been extremely impressed with the Washington Financial Bank team. They are true professionals, and they understand core values". Alex E. Paris Contracting has been a long time customer of Washington Financial because the Bank sticks to its core principles, its customer first philosophy, and to the basics of building relationships and understanding their customers. Paul & Lisa Scarmazzi, Hawthorne Partners, Inc.
"Washington Financial's customer first philosophy is exactly in line with Hawthorne Partners." How do you excel at developing residential living communities without listening to your customers? The answer is simple; you can't. Hawthorne Partners, Inc. develops and manages lifestyle condominium communities and has built their reputation on quality and customer service. Owned by Paul Scarmazzi and his wife Lisa, the company is proud of receiving the Guildmaster Award for exemplary quality and customer service, by Guild Quality, a national customer survey company for the building industry. The company's satisfaction rate of 96% beats the industry standard of 86% and that really matters to the Scarmazzis. So when the Scarmazzis were looking for a bank, they felt an instant connection with Washington Financial. "The Bank's customer first philosophy is exactly in line with that of Hawthorne Partners. We are committed to creating a way of life that our customers want," explains the Scarmazzis. "Washington Financial treats its customers in much the same way, going beyond providing traditional banking services, providing quality service and value." 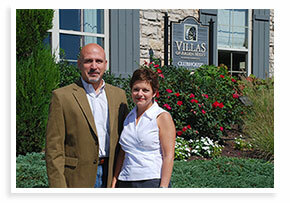 Washington Financial financed the first phase of The Villas at Arden Mills several years ago. When the economic climate changed, some other banks discontinued their financing of residential development lending. Not so at Washington Financial. The bank recently approved the financing of the next phase of Arden Mills. This shows the bank's commitment to its core business of lending money into the communities it serves. "The value gained from Washington Financial's experienced commercial lending team coupled with innovative product offerings such as the Business Express Online Solution are definite benefits." What's the true test of your relationship with your bank? As far too many companies have discovered, the answer is an economic slowdown. Industrial Gasket and Shim (IGS) is a custom-job manufacturing company with clients around the globe. When their industry experienced a slowdown in 2003/2004, they received little support from their former bank. That's when they switched to Washington Financial. 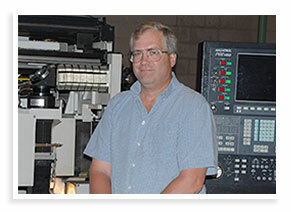 Washington Financial Bank quickly gained confidence in the company and began to finance new equipment. The relationship has grown from there. When asked why the company chose Washington Financial, Dave Sphar, Vice President of Operations for IGS noted that the Bank's commitment to understanding customer needs and providing quality financial solutions meshed exceptionally well with the IGS philosophy of having a strong commitment to its customers. "The value gained from Washington Financial's experienced commercial lending team coupled with innovative product offerings such as the Business Express Online Solution are definite benefits," said Sphar. Jeff Thomas, JT Thomas Homes, Inc.
"Washington Financial is a perfect fit because their values align with ours." When building and financing a custom home, you need an experienced team that takes you every step of the way. JT Thomas Homes, Inc. believes in developing a solid foundation for their custom homes and for their client relationships. As a custom home builder, Jeff Thomas, president of JT Thomas Homes, continues the tradition of excellence in building passed on to him from his father. Jeff is now bringing his son, Jesse, along in the family business. 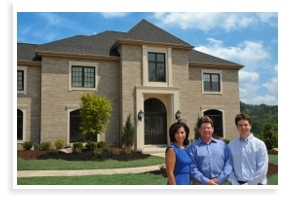 Through her real estate agency, Jeff's wife, Patty, is instrumental in marketing Thomas Custom Homes. The Thomas family relationship building philosophy is a perfect fit for Washington Financial because the Bank also values its relationships. In fact, Thomas said that his commercial lender, John Wishart, has become a friend of the family. "John is always accessible and responsive to my needs," said Thomas. "He's been there for me on nights and weekends." Because of Thomas' positive experiences with the Bank, he often refers his customers to Washington Financial and their affiliate, Washington Settlement Services. From the initial contact with JT Thomas Homes to the building, design and closings, Washington Financial is well equipped with corresponding financing and closing services. "Washington Financial is a perfect fit because their values align with ours," said Thomas. "I know that when I refer my clients to Monica Hamlin for a mortgage or Janet Mucha for the closing, they will be taken care of." JT Thomas Homes guides their clients every step of the way– making it easy to build a custom home. The Thomas family has over 50 years of experience and Thomas' business with his father, William and Jefferson, Inc., was awarded the 2003 Family Business of the Year by the Joseph M. Katz Graduate School of Business at the University of Pittsburgh.